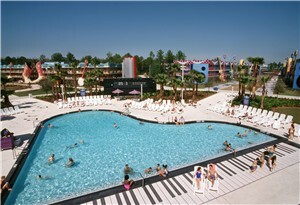 The All Star Resorts feature "larger than life" icons and colorful themes. These playful motel-style resorts are favorites for young children and large groups needing lower priced accommodations. 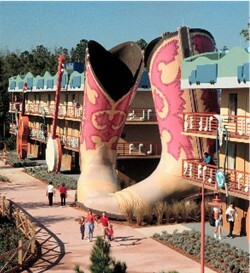 Each All Star Resort features its own main building and set of bus stops. The various buildings that make up the resort are spread out, and some can be quite a long walk from the main building, so choose a "preferred" room if you want a room close to the action. 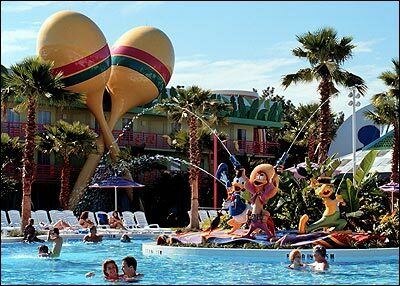 The three All Star Resorts are considered "sisters", so they share buses and guests are permitted to use the facilities at any of the three. 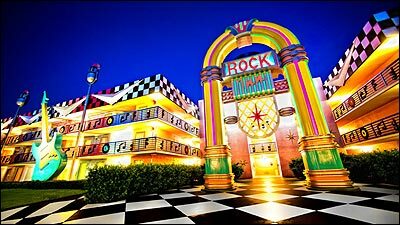 The All Star Music has 1,920 rooms. Building themes feature Calypso, Broadway, Country, Jazz, and Rock music. The Main Building at All Star Music is called Melody Hall. 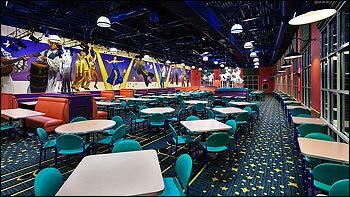 This is where guests will find the bus stops, front desk, gift shop (Maestro Mickey's), food court, and arcade. 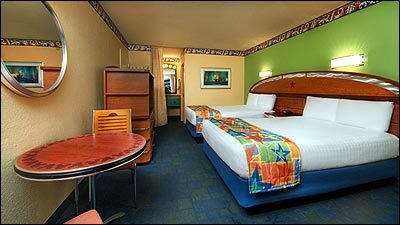 Room rates range from $89-$188 per night for regular rooms. Suites range from $216-378 per night. Rates fluctuate based on season and are higher on weekends and holidays. Number of beds: Most rooms have 2 double beds. Some rooms have king beds. Accessible rooms are available. Bathroom: Single sink and mirror in a vanity area that is separate from the tub and toilet. There is a privacy curtain to close off the vanity area from the rest of the room. Features of Room: Studio amenities and separate sleeping areas giving more privacy than a standard room. Private master bedroom and family room have 27” flat CRT TV and in room Wi-Fi. Kitchenette with microwave, small refrigerator and coffee pot. The units are all non-smoking. 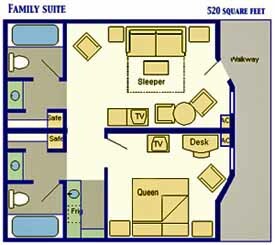 Occupancy: Maximum six-person occupancy per suite. Pizza delivery available from 4:00PM-12:00AM. Range of Food: Pizza, pasta, hamburgers, fresh sandwiches, salads, BBQ ribs, rotisserie chicken, fresh baked goods, and Family dinner platters. Drinks: Drinks are available at the Singing Spirits pool bar. Swimming: There are 2 pools. The pools do not offer a hot tub. Towels are not provided for the pools, so be sure to bring them from your room. Playground: There is a small playground. What buildings are classified as "preferred"? Calypso Buildings 1 & 10. Please note "preferred location" rooms are priced slightly higher than standard rooms. What buildings are closest to the bus stop? What building is the quietest? Quieter rooms are those away from the pool areas.